Okay! No more advertisements for Vroom Web Framework. 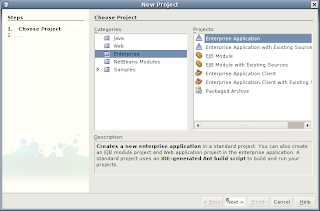 This time, I'll show you how easily you can build Web Applications using EJBs, Yahoo UI and Vroom Plugin 1.1.0 for NetBeans IDE 6.1. 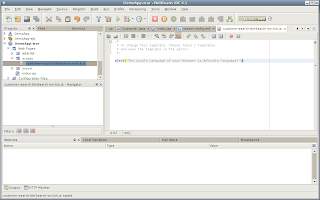 Step 2 - Enter the Project Name "DemoApp" and click Next! 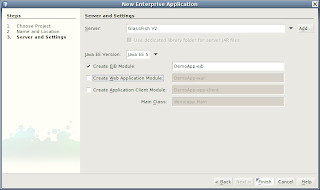 Step 3 - Uncheck Create Web Application Module CheckBox and Click Finish! 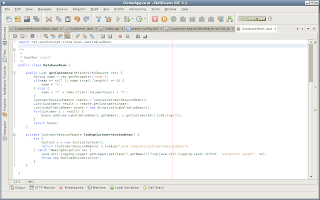 We'll build Web Application separately. 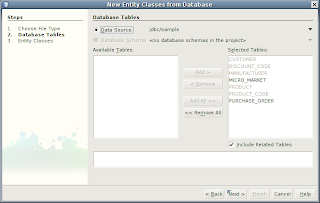 Step 4 - Create Entity Classes from Database using jdbc/sample database in DemoApp-ejb project. 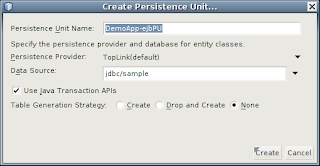 Step 5 - Create a Persistence Unit named "DemoApp-ejbPU" for jdbc/sample data source. 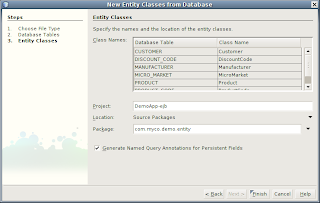 Step 6 - Keep the Class Names as is, enter "com.myco.demo.entity" in Package field and click Finish! 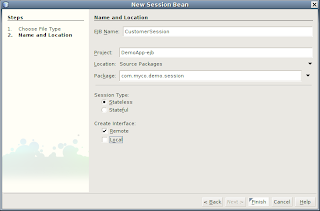 Step 7 - Create a SessionBean named "CustomerSession", enter "com.myco.demo.session" in Package field, check Remote check box, uncheck Local check box and click Finish! 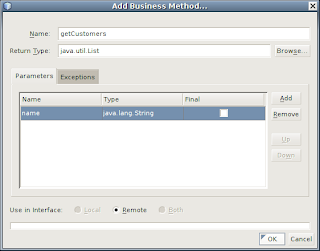 Step 8 - While being inside CustomerSessionBean.java file, select EJB Methods/Add Business Method... from the context menu to add a business method. 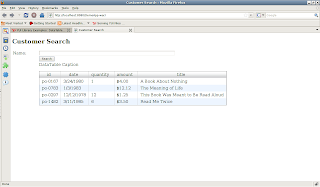 Enter "getCustomers" in the Name field and "java.util.List" in Return Type Field. 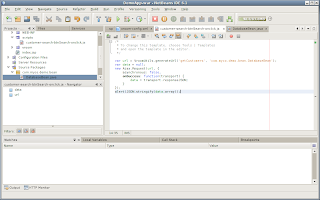 Add Parameter "name" of type "java.lang.String" and click Finish! At this stage or EJB is ready as per our requirement. 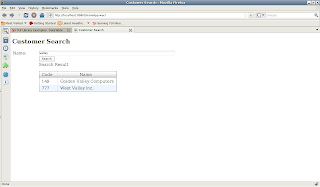 Now we'll create a web application which will use this CustomerSessionBean to get customers list and display it in Yahoo UI DataTable. 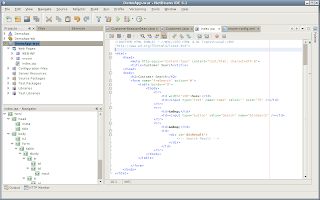 Step 1 - Create a Web Application named "DemoApp-war" and click Next! 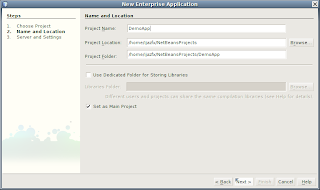 Step 2 - Make sure you don't include the application to the DemoApp Enterprise Application. 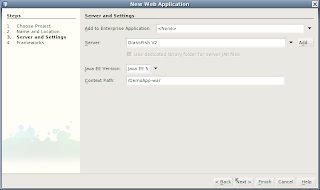 Select GlassFish from the server list and click Next! 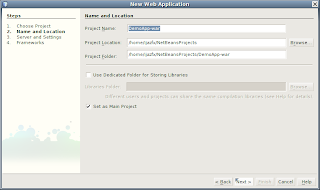 Step 3 - Check Vroom Web Framework from the Frameworks, leave the properties of the framework unchanged and click Finish! 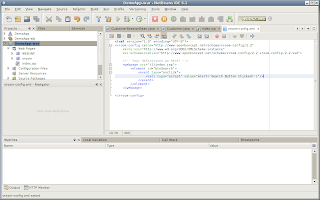 Step 8 - Debug the application and click "Search" button, you'll see the message "Search Button Clicked". 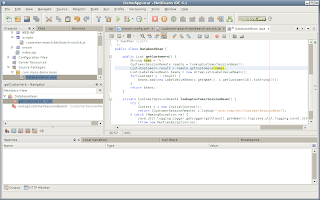 Step 12 - Debug the application and click "Search" button. 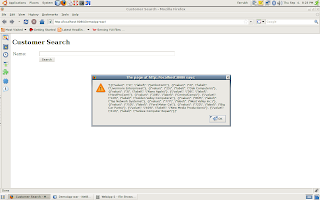 This time you'll see the alert that was placed in customer-search-btnSearch-onclick.js file. 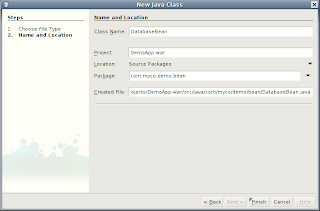 Step 1 - Create a Java class named "DatabaseBean". 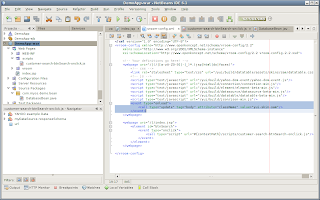 Enter "com.myco.demo.bean" in the Package field and click Finish! 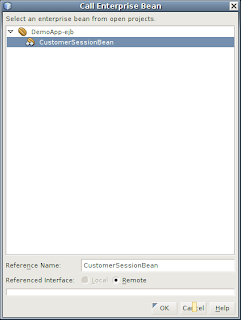 Step 2 - While being in the DatabaseBean.java, select Enterprise Resources/Call Enterprise Bean... from the context menu, select CustomerSessionBean in the list and click OK! 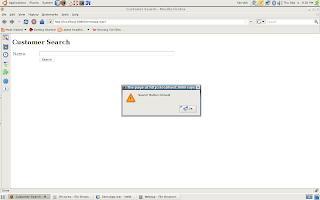 Step 5 - Debug the application and click "Search" button. 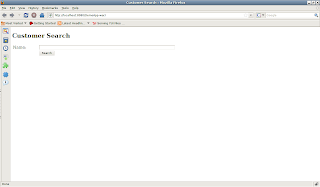 This time you'll see the list of customers in JSON format in an alert. The alert is just to check that we're getting correct results. Now we're going to add Yahoo UI DataTable. 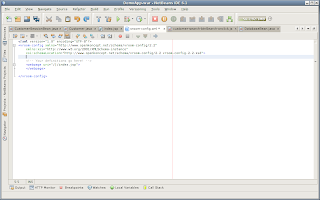 Select Connection Manager, JSON and DataTable in the configuration. In my setup I've deployed complete YUI library as a war file to my GlassFish server with /yui/ context. All the scripts and CSS are available under "build" folder which can be accessed with base /yui/build/. 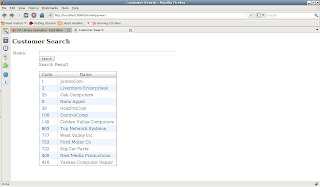 Step 4 - Place the DataSource script and DataTable script in the customer-search-btnSearch-onclick.js file. 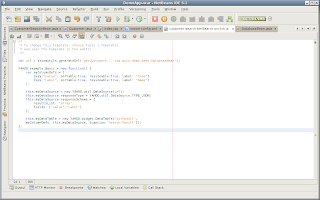 Replace the "basic" parameter of DataTable with "divResult". 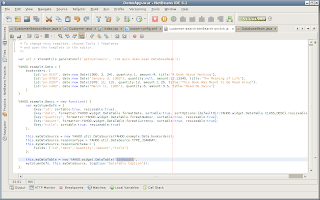 Step 5 - Save the files and Debug the application. 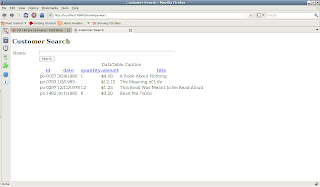 Click Search button and you'll see the following table. There is no skin applied to YUI components by default. 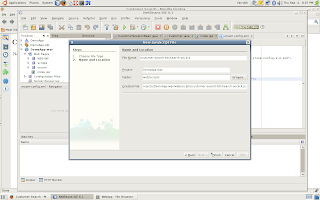 To apply that we need to set the class attribute of the control or body tag to "yui-skin-sam". 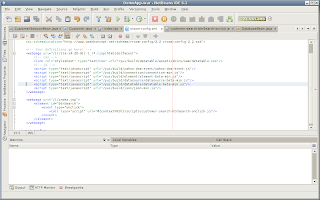 Note that we've used the url we generated using VroomUtils.generateUrl() method in DataSource constructor. Another important thing to note is we've also defined resultsList: "array". The reason for specifying this is because Vroom Web Framework adds the returned object to an internal Map and converts the Map to JSON object. 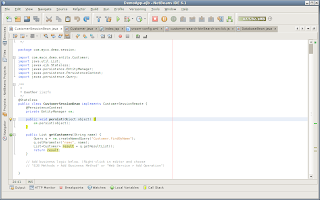 All basic data types are accessed using "value" key and Lists and Arrays are accessed using "array" key. Step 9 - Now refresh the webpage and click Search button and you'll see the YUI DataTable is loaded with our Customers list. You can return any type of java object, the framework will try its best to convert it to JSON string. 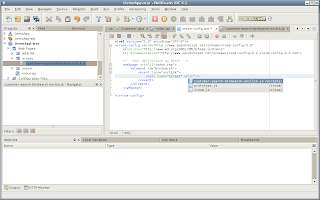 Step 12 - Now Debug the application and type "com" in the text box and click Search button. You'll find only those customer which contain "com" in their name. 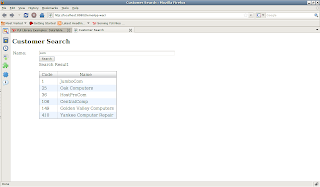 Step 13 - Try another by typing valley in the text box and click Search button and you'll find only those customers which contain valley in their name. That's all folks. I hope this time I tried my best to explain the potential of the framework. 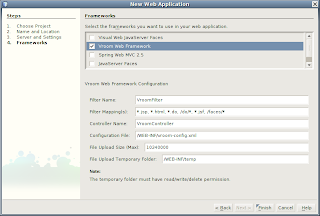 No matter what web framework you use, you can always empower your web application with Vroom Web Framework. 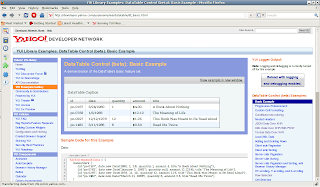 No other framework provides such a powerful and flexible way to control your application. Please do provide your feed back about the framework.